And how it will make your garden look awesome? Fact 1: Pruning will encourage your plants to new growth, better yield, more fruits and more flowers. When I say that it's magic, I really mean it – you make a cut and new growth emerges. Fact 2: Pruning is the perfect combination of science and art. Most plants get excited after you prune them, and the fact is, your plant will pay you back tenfold when you make a good cut. I won’t get into scientific explanations of a plants anatomy, but if you cut a plant, you will notice it grow. Fact 3: Anyone can do it. And it’s easy. Just like driving a car, or riding a bike, all you have to do is let go of the fear of killing your plant – because it won’t die, it will live even better. All you need to do is pick up a pair of shears, follow some basic guidelines (which you will ding right on this site) and you're in the game – you’re pruning! Fact 4: Plants are the organisms with some of the strongest survival instincts on the planet. Just look around, wherever you turn there are plants. They are able to live in different regions, under different and some of the most extreme weather conditions, in the ground, in rocks, in pots… plants will always find a way to adapt themselves to their environment. Some never get pruned, and that’s fine, nothing really will happen to them. Home garden plants are much the same. Except for a few plants, which require a somewhat different caring routine, most will all be more than happy to have a ‘hair cut’ every once in a while. All you have to do is follow the basic rules and guidelines (which are super easy to maintain), and I promise, if you’re not already, you will soon be inlove with your plants and garden. Now, let me show you how cutting actually creates new growth, better yield, more fruits and more flowers. Here is my proof, and it says it all!! 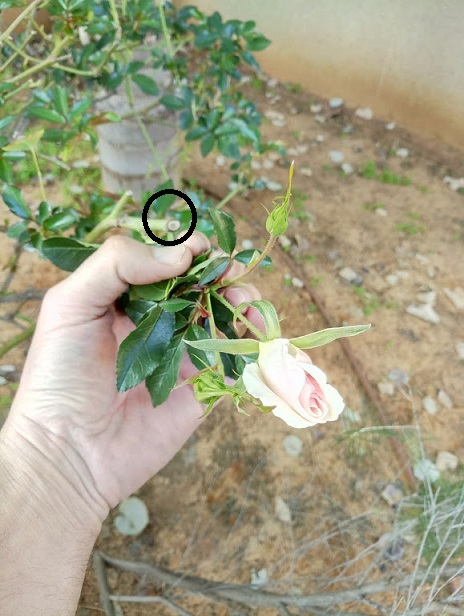 Look at the black circle marked in the picture – inside it you can see a 5 week old cut. Now look at the rose and leaves in my hand. Only 5 weeks after the cut, and this amazing new growth!! 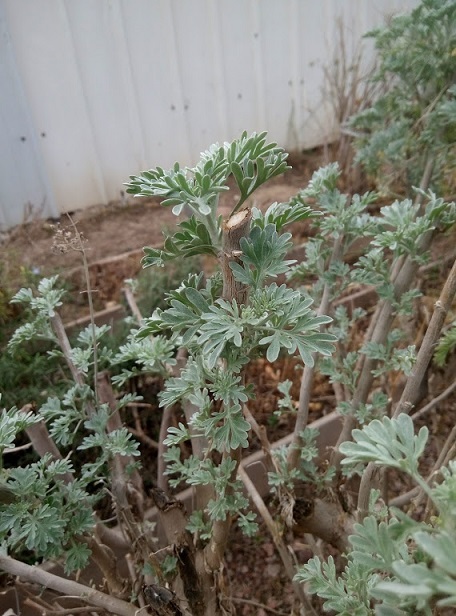 That’s the amazing thing about pruning – you cut something and it grows new life! So, what are you afraid of? There is absolutely no reason for you to worry. If you "cut" your plants, they will repay you. I was cutting that rose bush only a few weeks ago, and now it has repaid me with that beautiful new flower. Who wouldn’t want the same experience... ?? 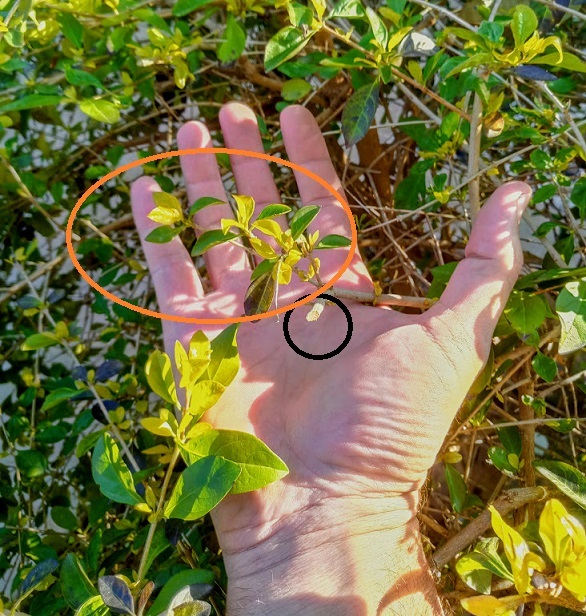 Here is another example - old cut in the black circle, new growth in the orange circle. Now let’s take both your gardening skills and your garden to a rewarding new high. Join me and I’ll show you simple, recommended techniques that I myself use, and have been over a 20 year career. Think of me as your favorite teacher… who is also available to take your questions 24/7. Fact number 5: Regardless of whether your plant lives indoors, or outdoors, whether it’s young or old - like the Sheba in the picture - they will all appreciate the attention and reward you in the same wonderful way. "I don't have green thumbs"
"I'll cut it all wrong"
"Whenever I touch a plant, it dies"
"Plants are only for professionals"
And If you don’t find what you’re looking for here, please contact me with your questions. I’ll do my best to answer them as quickly as possible. I’ll also add the information to the website, both for your quick reference and so that others can benefit from it.